සැහෙන කාලෙකින් ඔන්න අද පොස්ට් එකක් ලියන්ඩ හිතුනා.අද එක නං මොකුත් software එකක් ගැන නං නෙමේ තියෙන්නේ. 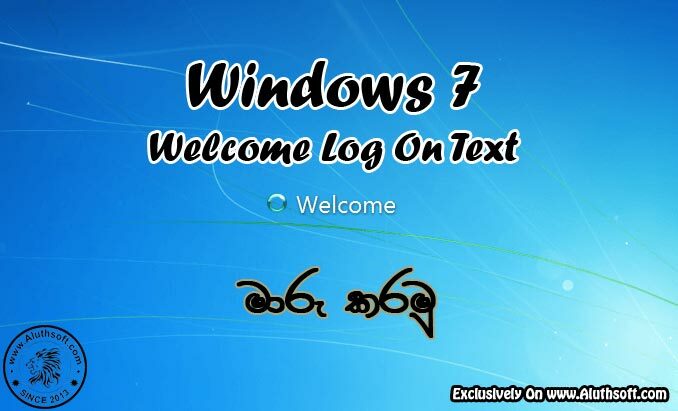 මේක guide එකක් Welcome Log On Text Message කරන්ඩ තියන. 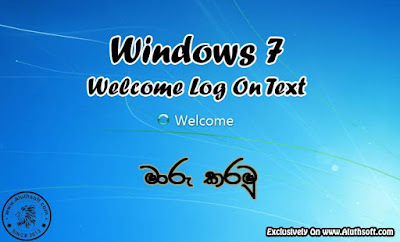 මේක වලංගු වෙන්නේ Windows 7 වලට හා Windows Vista වලට විතරයි. එහෙනං පටන් ගමුමමමේක setp by step මේක කියලා දෙන්නන්.හැබැයි වෙන වෙනමගුලවල් කරලා කෙලවගත්තොත් මම දැන් නැ ඉතින්. 1. මුලින්ම පහල තියන path එකට යන්න. මෙහි en-US යනු තමාගේ OS එකේ language එකයි. 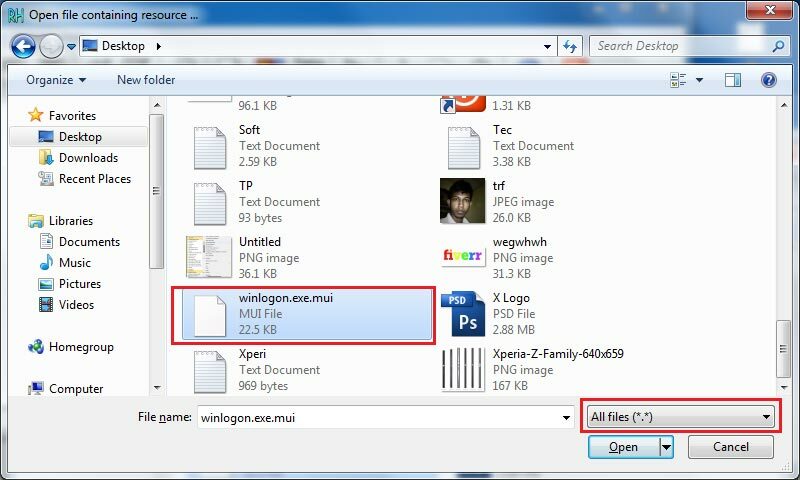 දැන් ඒ folder එක ඇතුලේ තියනවා "winlogon.exe.mui" කියලා file එකක්. එක copy කරල Desktop එකේ paste කරගන්න. 2. ඊලග step එකට පොඩි software එකක් ඕනේ වෙනවා. 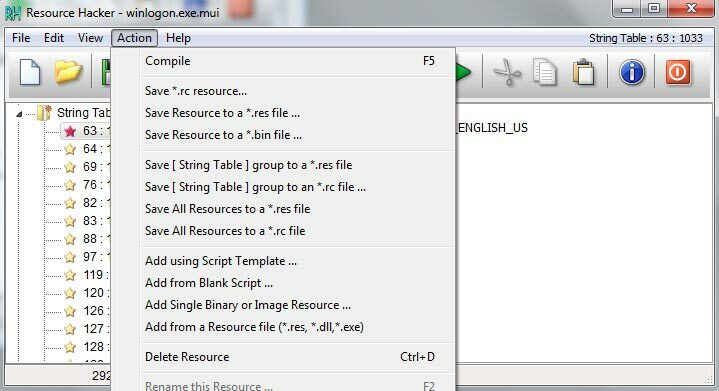 එකේ නම තමා Resource Hacker. පහල ලින්ක් එකෙන් බාගන්ඩත් පුළුවන්, නැත්තන් Google පාරක් දාල ගන්ඩත් පුළුවන්. මෙතනින් බාගන්න.බාල මේක ඉන්ස්ටල්ල් කරන්න. 3. දැන් මේ software එක Run As Administrator කරන්න. 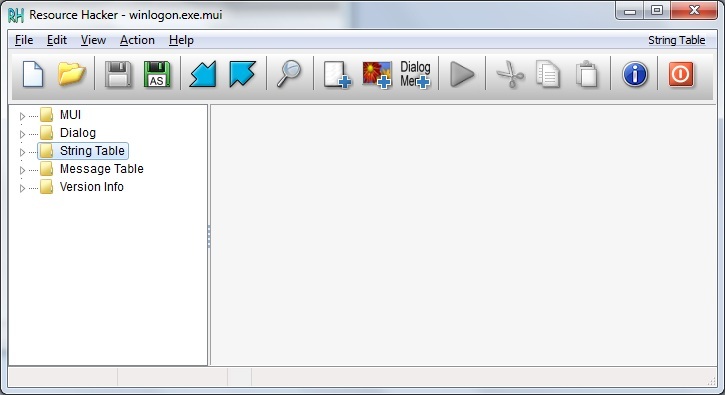 දැන් Resource Hacker එකේ File > Open ගිහින් අර Desktop එකට copy කරගත්තු "winlogon.exe.mui" file එක open කරගන්න. දැන් පහල ෆොටෝ එකේ විදිහට තමා Resource Hacker එකේ පෙන්නන්ඩ ඕනේ. 4. හරි. දැන් එකේ තියන "String Table" එක double click කරන්න. දැන් එහි "63 : 1033" click කරන්න. දැන් එහි 1002 යටතේ ඇති Welcome කොටස ඔබට කැමති message එකකින් replace කරන්න. එලෙසම 1005 යටතේ ඇති Welcome කොටසද ඔබට කැමති message එකකින් replace කරන්න. මම මෙහි Welcome Back Yasiru ලෙස මාරු කර ඇත. 5. 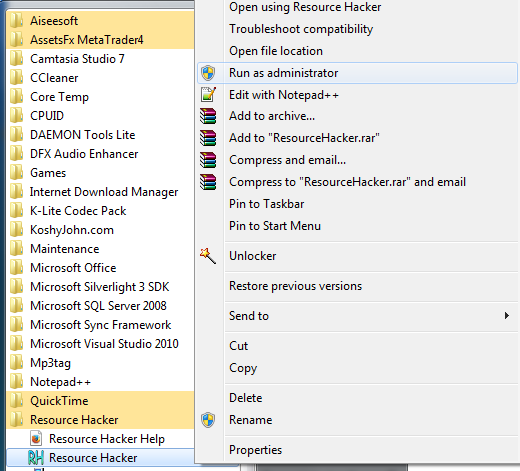 දැන් Resource Hacker එකේ Action menu එකට ගිහින් Compile click කරන්න. 6. දැන් File > Save click කරන්න. 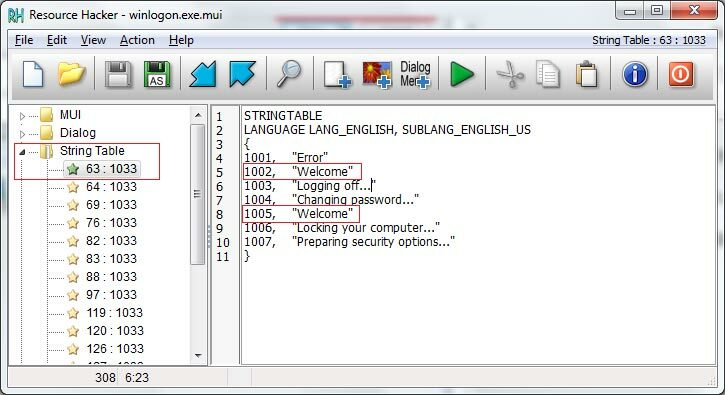 දැන් Desktop එකෙහි "winlogon.exe.mui" හා "winlogon.exe_original.mui" ලෙස files දෙකක් ඇත. අපි වෙනස් කල දේ save වී ඇත්තේ "winlogon.exe.mui" ලෙස ඇති file එකට බැවින් අනිත් "winlogon.exe_original.mui" file එක නොසලකා හරින්න. 7. දැන් නං වැඩේ 70% ක්ම ඉවරයි. දැන් අපි මේ edit කරපු "winlogon.exe.mui" file එක තිබ්බ තැනටම දාන්ඩ ඕනේ. මේක කරන්ඩ ලේසිම ක්‍රමය තමා Safe Mode එකෙන් පරිගණකය ඕන කරල තිබ්බ තැනට මේ file එක copy paste කරන එක. 8. Safe mode එකට යන ක්‍රමත් ගොඩක් තියනවා. On වෙද්දී key එකක් press කරලා යන ක්‍රමේ ලේසි, ඒ උනාත් එක එක අයගේ machine වලට එක වෙනස් වෙන්ඩත් ඉඩ තියනවා. එක හින්ද වෙන ක්‍රමයකට යමු. 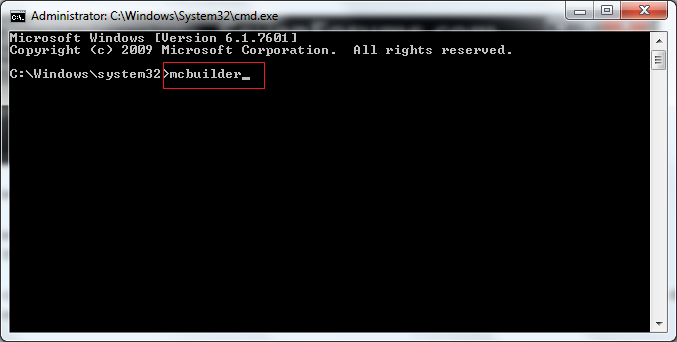 මුලින්ම Start Menu eke "msconfig" ලෙස type කරන්න.එවිට එකම එක Program එකක් search වෙයි. එය Open කරගන්න. 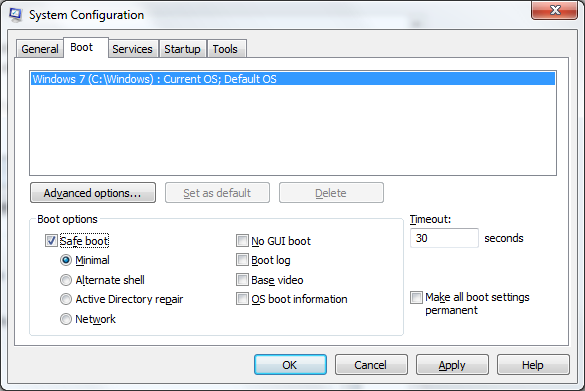 දැන් මෙහි Boot නමැති ටැබ් එකට ගොස් Boot options යටතේ ඇති safe boot ට tick එකක් දමා ok කරන්න. දැන් Pop up එකක් ඊ restart කරන්ඩද කියලා. කෙලින්ම Restart click කරන්න. ඉන් පසු ඔබේ පරිගණකය Safe Mode එකෙන් පනගැන්වෙනු ඇත. 9. Safe Modeඑකෙන් boot වූ පසු desktop එකෙහි ඇති "winlogon.exe.mui" file එක cut/copy කර "C:\Windows\System32\en-US\" path එකට ගොස් paste කරන්න. Replace කිරීමට ඇසු විට Copy & Replace or Move & Replace click කරන්න.එවිටfileඑකreplaceවෙනිඇත. 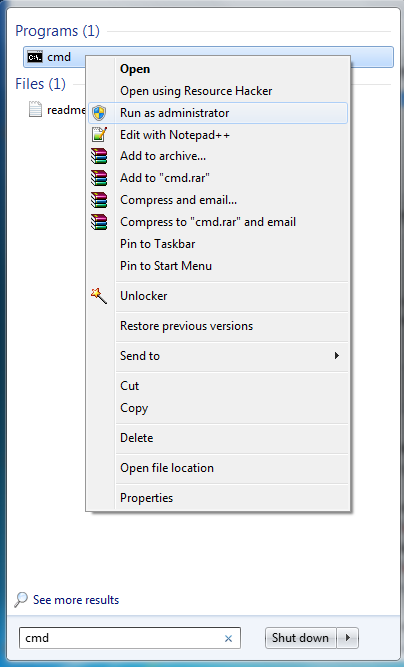 (එසේ නොවුනහොත් මුලින්ම "C:\Windows\System32\en-US\" path එකෙහි ඇති "winlogon.exe.mui" delete කර නැවත desktop එකෙහි file එක copy කර බලන්න. 10. දැන් දැන් Start menu එකෙහි cmd ලෙස search කර එය Run As Administrator ලෙස open කරන්න. දැන් එහි "mcbuilder" ලෙස ට්ය්පේ කර enter press කරන්න. 11. තවමත් අප සිටින්නේ Safe mode එකෙහි බැවින් අප මෙයින් ඉවත් විය යුතුය. 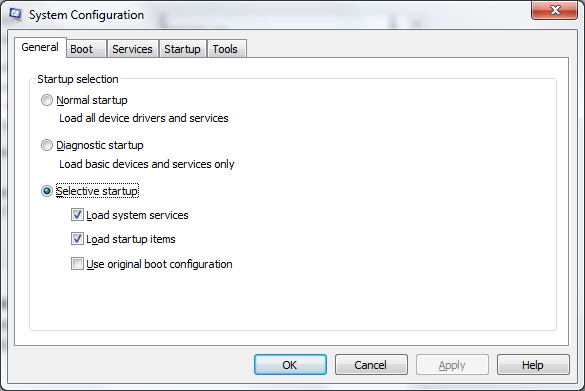 ඒ සඳහා නැවතත් කලින් කල ආකාරයටම Startmenu එකෙහි "msconfig" ලෙස type කර අදාළ Program එක open කරගෙන එහි boot ටැබ් එකහි safeboot ට දැමු tick එක ඉවත් කර ok කරන්න. නැවත restart කිරීමට ඇසු විට Restart click කරන්න. එවිට ඔබේ පරිගණකය සාමාන්‍ය ලෙස boot වෙනු ඇත. Welcome Screen එකට ආ පසු Welcome එක මාරු වී ඇති බව ඔබට හැගී යනු ඇත. කාලෙකින් ඔන්න Post එකක් දාන්ඩ හිතුවා. කට්ටියම දන්නවනේ මේ ඊයේ පෙරේදා Microsoft Office 2016 Officially ම Release උනා කියලා. සමහර අය නං මේකේ කලින් ආපු Preview එහෙම නිකන් try කරල බලන්ඩත් ඇති. 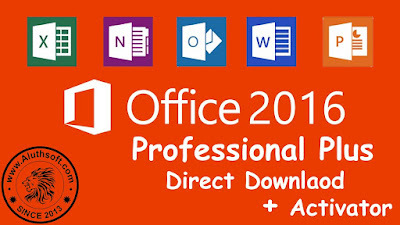 Microsoft Office 2016 කියන්නේ ඉතින් Windows 10 type එකට ගහපු එකක්. පට්ටම තමා ඉතින් මේක. එකම අවුලකට තියෙන්නේ මේකේ Setup එක 2.3GB විතර තියනවා. ගොඩක් අපේ කොල්ලන්ට ඉතින් මේකdownload කරන්ඩ වෙන්නේ ඉතින් අර Dialog 50 Package එක දාල තමා. හරි එහෙනං පටන් ගමු මේක දාන්ඩ. 1. මුලින්ම පහල ලින්ක් එකට ගිහින් මේක setup එක තියන rar file එක download කරගනිල්ලා. 2. දැන් Download කරගත්ත rar file එක Extract කරගෙන Setup.exe එක open කරලා setup එකේ instructions වල විදිහට install කරගන්න. 3. දැන් එක පාරක් Word වගේ එකක් Open කරලා close කරන්න. 4. දැන් Activator එක පහල Link එකෙන් Download කරගන්න. 5. මේ Activator එක Run කරන්ඩ නං අනිවා .Net Framework 4.0 හෝ ඊට වැඩි එකක් අනිවම ඕනේ. නැත්තන් මෙතනින් Download කරලා install කරගනිල්ලා. 6. 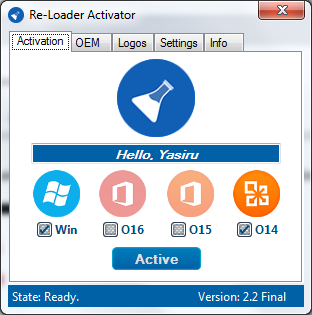 දැන් Download කරගත්ත "Reloader - MS All In One Activator - Aluthsoft.rar" එක Extract කරගෙන Activator එක Open කරගන්න. දැන් ෆොටෝ එකේ විදිහට O16 ට tick එකක් දාල Active click කරන්න. එච්චරයි. 7. දැන් මෙන්න මේ Photo එකේ විදිහට වැඩේ වෙලා තියෙයි ඇඩෙන්ඩම. 8. එහෙනං මම ගියා. අවුලක් එහෙම අවොත් පහල Comment දාහල්ල.